Childhood is the best time to learn music (as well as anything else). However, as all parents know, keeping children interested in anything is a herculean task. Kids have short attention spans and an abundance of impatience. Learning the guitar is only possible after the child's hands are large enough to hold the instrument. Normal sized children five years and up can start playing the guitar, just be sure to get a suitable sized guitar (1/2 scale or 3/4 scale). The worst thing you can do is force the child to play the guitar, they will lose interest real fast if they perceive it as doing "homework". At younger ages, it is best to simply leave the guitar in the child's room. Children are naturally curious, and they will pick up the guitar and try playing with it on their own. Once they get hooked to the sounds they can make from it, you can introduce lessons. Books, videos and online guitar lessons are NOT going to work with kids. You have to get a guitar teacher involved, kids just cannot focus on self-help tutorials. Once formal training has started, gently establish a "practice schedule" so they try out the new things they are learning on the guitar. No matter how hideous the sound they produce - encourage and praise their effort! It can take a year or more for a kid to start sounding reasonably musical. If you play any musical instrument, invite the child to play along with you, they will have fun and it will increase their interest in music. 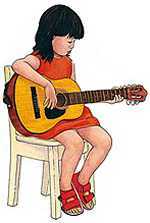 For young children 5 to 8 years old, you should consider buying a Nylon String Acoustic guitar of a short scale. The 1/2 scale guitar is tiny and most kids would outgrow it at 6 years of age, but it depends on the size of your child. The 3/4 scale guitar is suitable for most kids through to 10 or 12 years of age. After that, their hands are usually long enough to handle adult scale guitars. Nylon string acoustic guitars are good for smaller kids as they are easier on their fingers, they will find steel string guitars painful to play. Older kids may be fine with steel strings, but it depends on your childs personality as well. The type of music that you want your child to learn is also an important decision factor in selecting a guitar. For classical music, nylon string acoustics are the best. Older kids may demand a cool-looking electric guitar with flames painted on it - if they are going to play it, go ahead and get it for them. But keep in mind that acoustic guitars don't need anything else (except a large collection of picks, most of which will get lost or converted into playthings). Electric kids guitars will also require an amp (amplifier) - and are MUCH louder. But no matter what scale and type of guitar you choose for your child, get the CHEAPEST one. Quality is not an issue for kids learning to play the guitar. Smaller kids are likely to break the guitar, accidentally or otherwise. No other accessories are needed, except for an amp if you get an electric kids guitar - and lots of picks. If you are sending your child out for guitar lessons, you may want to consider a carrying case - but for the cheap guitars it may cost more than the guitar itself. Having an electronic tuner will allow you to ensure their guitar is in tune, but at the younger ages it will not make any difference. Once formal guitar lessons are started, the guitar teacher will ensure the child's guitar is properly tuned. For older kids and acoustic guitars, you may want to consider the smaller scale adult guitars; such as the 00 or 000 scale. If their hands and fingers are long enough they should be able to play these adult sized guitars as well. Click to view Basic Guitar Lessons, or how to Choose Acoustic or Electric Guitar. One word of caution: some people are selling books, videos and even offering lessons about teaching kids to play the guitar by keeping it flat on the child's lap and using a slide (like blue-grass slide guitar players). This is a tremendously BAD way to teach a child the guitar - they will not be able to play holding the guitar upright the normal way. They will have to un-learn this wrong technique at a older age, it just wastes their time and will discourage them later.